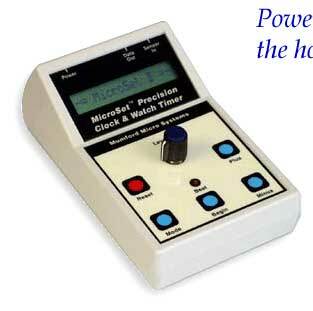 MicroSet is an electronic timing device which measures mechanical clocks and watches with unprecedented precision. It can measure beat times to within a millionth of a second and resolve rate errors as small as one second per week. Since it was first introduced in 1997, MicroSet has revolutionized clock timing with many breakthrough features including an optical sensor, high precision measurements, powerful computer interface software, and additional diagnostic functions. We have a MicroSet tailored specifically for watch timing too. Overview -- For a description of the different models and features of MicroSet, click here. Watches -- If your interest is primarily in watches. Santa Barbara Courthouse Clock -- See MicroSet in action on a real clock in real time. If you have specific questions, please give us a call or send an email.